(Newser) – This year's iPhone, revealed Wednesday, is seen as a more modest upgrade, as several analysts noted that it was increasingly difficult to make impressive changes in hardware, the AP reports. 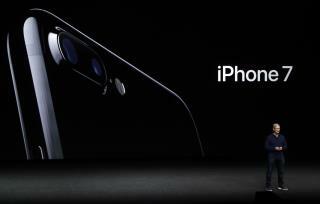 Among Apple's biggest changes are nixing the headphone jack and adding a "dual lens" camera to the higher-priced 7 Plus model. Some thought that could be enough to entice new users. "I believe Apple did enough to keep the base happy with upgrades and arguably did enough to attract some Android users," one analyst says. Can't wait until the time that we can implant a small speaker on the inside of the ear lobe. Hear what you want, when you want, literally, all the time. Headphone Jack is my son's name. "and arguably did enough to attract some Android users," Not possible. Anyone with a brain that has used both will know that Android phone are superior as long as you buy from one of the major brands. Samsung has been the best, despite the recent battery issue, but there are other great Android makers too.